Whew! June 1st already! Time for summer! :) Over at Scrap It Girl we are celebrating things with wings. I made this card. For the background I put mustard seed distress ink and then I used cleared embossing powder on the stamp along the side (Tim Holtz). This is one of my favorite stamps fyi! Because I used clear embossing powder you can see the variation in the ink-which is what I wanted. Then I stamped the flowers (tim holtz) with dusty concord distress ink and put clear embossing powder on it. So fun! I used a musical stamp from Sparkle N Sprinkle in the background and the dots are from Rubber Stamp Tapestry. Then with silver colorbox ink, I used a Tim Holtz stars stencil to add to the background. I used Tim Holtz seedless perserves paint and glitter on the bird. And then the sentiment is from Dylusions. A new stamp set that I am finally using-yay! :) I added Tim Holtz stars too. I don't know what it is about those little stars but they are awesome. 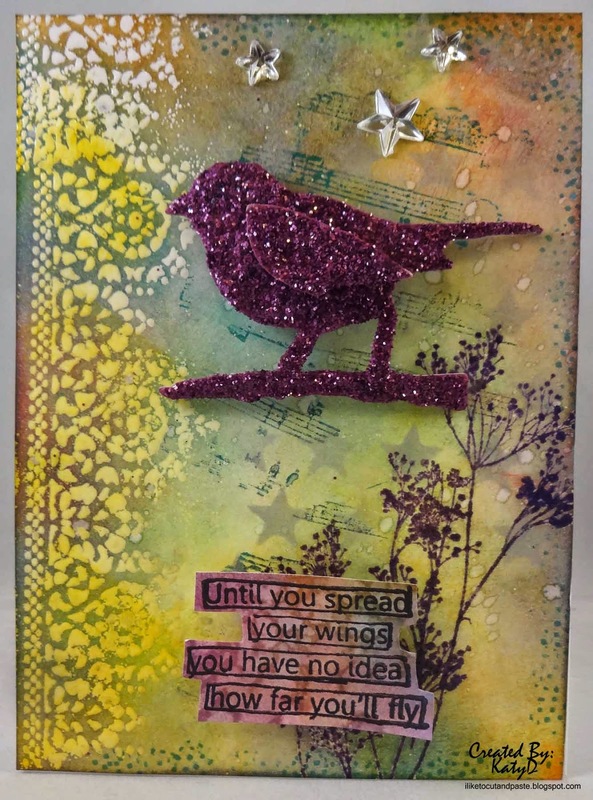 I am linking this card to the challenge at Simon Says Stamp Monday Challenge: The Artsy Stamp. Until next time my friends...it's time to fly away! wow that bird is amazing.. totally fabulous.. This is a fabulous creation! I adore that bird as the beautifully blingy focal point, yet the background is equally stunning! The subtle touch of nature is there, yet you've also got whimsical music notes, stars and dots. It's an elegant and sophisticated combination and the color palette is stunning. I also really like the lace you did up the side. Gorgeous work and thanks so much for sharing your talents with us for this week's Simon Says Stamp Monday Challenge! Fabulous creation Katy! So many details in there.. love it.. Totally!